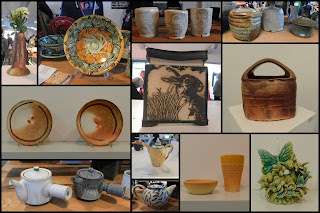 Central Region of the Maine Pottery Tour -12 Stops; Fine Mess Pottery is one of them! Published in "Atmospheric Glazes" by Lisa York, in the Dec 2015 issue of Ceramics Monthly. Do not apply thick or it may shiver or become runny. Two tiny tiny rough spots on the interior are what renders this gravy boat - otherwise my favorite piece from the firing! - a 2nd. Not enough to compromise the function, mind you! Juuuuust enough of a flaw to put it over the line. Silver lining? Somebody out there will get a great bargain, and this pot will serve its useful purpose in the world. This pot doesn't actually have a flaw - just a demo that doesn't really belong anywhere. I was demonstrating a couple of things - the spiral pattern on the inside is a pattern of dark clay inlaid in white. The resulting slab was placed over a hump mold, so my beginners could see that process. 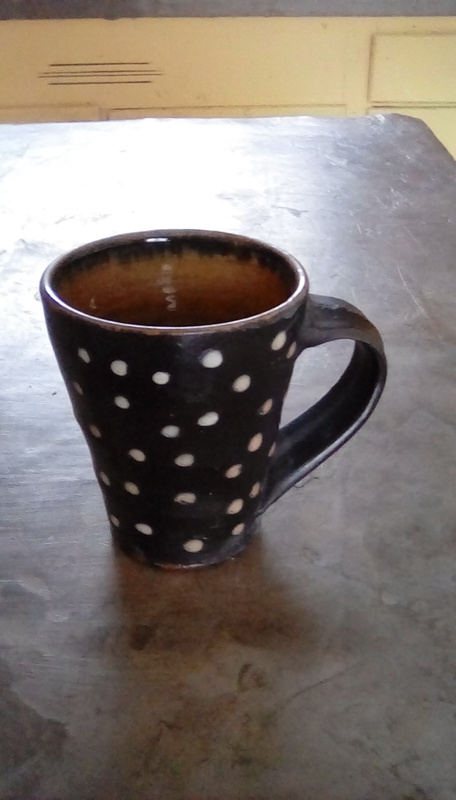 Got lucky with the Malcolm Davis Shino - the Mad Dog, as my friend Peg likes to call it - like you sometimes do with that glaze and its wonderful carbon-trapping properties. 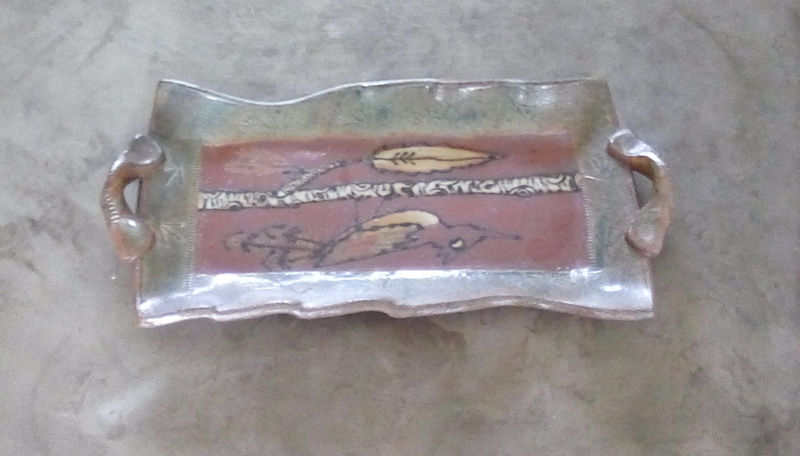 It's about 6 inches wide. Check it out here! 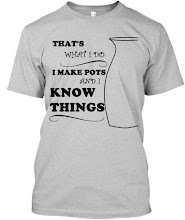 Nothing wrong with this pot either! It was a throwing demo, which I then used to demonstrate stamping & slip trailing. Just a basic workhorse shino on this one; pretty nice all the same. It's also about 6" wide, destined to be somebody's go-to bowl for cereal, soup, mac 'n'cheese, even ice cream. Maybe you? Check it out here. I used this pot as a glaze demo when the little loop on the side proved to be too small for the pate knives I bought for that purpose. That'll teach me: Always do the math! This little pickle fork fits just fine, though, so this pot has found a new purpose in life: it's a pickle dish! Do you need a pickle dish? As usual I wanted to buy allllll the pots & alllll the tools. As usual I kept my spending in pretty close check. I came home with three new pots. (These photo are distinctly half-assed! Just wanted to something posted. 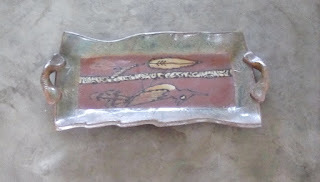 And a lovely little tray made by my dear friend Mary Jo Schmith of Front Avenue Pottery and Tile. 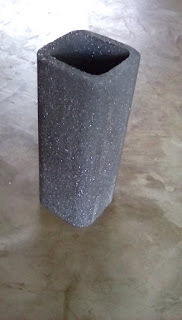 As for tools, I got myself an unglamorous shelf grinder, made of the same material my Advancer kiln shelves are made of. I do most of my shelf clean up with an angle grinder, but it's awkward for edges, and sometimes I just need a quick spiffy-up, and it's a pain to drag out the power tool & extension cord when a little scrub from an abrasive tool will do. I've had the one with the red plastic handles before, but they cost as much as a diamond cup for the grinder & really don't last long. We'll see how this performs. What did I almost buy, you ask? I was pretty interested in the Slab Mats. I meant to order some new kiln shelves while I was there but it didn't happen. Quiz: In which of these images was I mildly intoxicated? If you guessed ALL OF THEM, you are correct! Next year is Richmond, Virgina; after that, Cleveland (I think?) Will I make it to those? Hard tellin not knowin, as we say in Maine. What makes you want to visit a city? I'd argue public art is instrumental in creating a sense of place, a uniqueness that draws people. I hiked three miles across the city of Minneapolis to take a photo of the iconic Spoon Bridge. That was no hardship - I like to walk in cities I am visiting, and I like to have a specific destination. Which kind of proves my point: monumental and very visible art creates landmarks and reference points, and brings the city into focus. It interrupts the sameness of cities, in the same way that a focal point in a painting will do. I wanted to take a photo of the Spoon Bridge, even though there are thousands of better photos of the Spoon Bridge online. I wanted to touch it (visually only!) and make it one of my places, in that way. 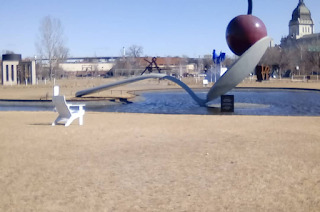 The Spoon Bridge helps anchor my sense of place and sets Minneapolis apart from other cities I have visited. I've already forgotten the convention center and the airport (even though I am currently sitting in the airport! ); the hostel was fine and interesting but could have been a crumbling mansion in any city. The Spoon, though? The Spoon defines the visit, though I was only there for a few minutes, and creates commonality between visitors. It's a shared, and memorable, experience. Anyway. More public art please, cities! It's always what I remember about my stay. Flatten ball, make hollow for palm. Makes life line and head line. Compare where the lines on your fingers land, how they line up (or don't ) with each other. Sizes each finger to his own finger, puts in the lines, cuts at the widest part - where it attaches to the hand - at a 45 degree angle. Just spritzes, no scratching or slurrying. Cutting at angle naturally creates the crease where your finger meets your hand. Takes clay from the middle of the bag because it's the wettest there. Pinky finger attaches on a downward slope away from the others. Makes coil (like the others) with his own hands at opposites, right on top, fingers over left wrist. Making finger too curved "defeats the believability" of the finger. First knuckle straight, 2nd knuckle slightly bent. a relaxed hand. Pokes a finger into the hand, pushes out from inside to fill out the fat part of the hand below the thumb. Notice difference of thumb: not a carrot. (I dunno, mine kinda is.) Only two section. Is attached at different angle. Common error: attaching thumb too high, too close to finger. Double distance between index finger attachment & head line, that is the distance from index finger to thumb. Thumb has to attach so the pad side faces toward the fingers, not outward. Palm first because that's where the muscles are, more detail. The knuckles on the back are defined by what's happening in the palm side. Fingers are still pliable enough to bend, or squeeze pal, to create the gesture. He brings middle finger to touch thumb, straightens index a bit. "It's communicating more"
Now he can look at his own hand in that gesture and see where lines and bulges occur. Adds a little bit of clay on the spot where the knuckle lands. Finger is three short straight lines with angles at the knuckles. Adds clay where dents occur. Arthur started sculpting hands in the mid 80s. Question: Do you do life drawing? A: Yes, but not as a studio practice. Teaches drawing, so sometimes does as part of class. Back of hand looks puffy (beestung) Hand should round from side to side, straight lengthwise, along the bones. Talks about how people will make BONES curve around the torso when they want the arm wrapped around, instead of making the flesh push in. Paddles with the pinky side of his own hand back straight along the plane of the bones. Uses hand because "I don't have the patience to pick up a tool" but also because it makes everything soft & organic, no tool marks. Will go back & make knuckles look more believable. Cuts off the bottom edge to start with a fresh edge to make the wrist. Will make the wrist bend more, because the angle will make the shape more interesting, aesthetically pleasing "that's a very old rule." As he adds coil he pushes on the inside. One coil at a time, not overlapping (snaking) one around. More control. Squeezes on outside to resize the wrist. Pinches to even the wall and create the desired shape. Creates curve of wrist. "More dynamic" "How do you make a painting more interesting? Add angles. Your eye likes that." How do you make a sculpture more intereting is add negative space. Why he made the thumb touch the middle finger, to creat the loop of negative space. Uses fettling knife so the opening at the wrist is pointing in the right direction. Makes lines of hand & wrist with his fingernails, because it is a soft line. Adding third coil to wrist. Joins coil completely, no seam inside or outside, will create a vulnerability to cracking. "That's the key, to everytime you make something, you have to look at it like you didn't make it. You have to see it. When you get to the point that you don't know what you are seeing 'I don't know whether this is good or bad' you have to stop. Take a break, go have lunch. When you come back you will see it right away. " I guess they are going to take a photo with all the make-along hands? So I'm out. 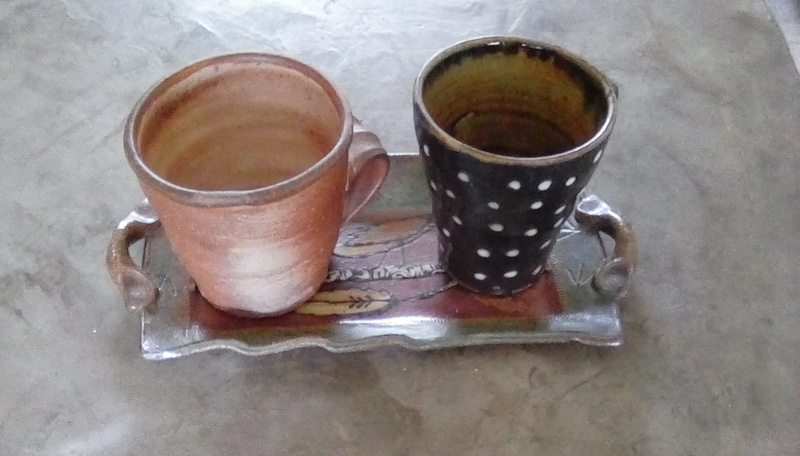 Super excited to be seeing my old studiomate, Mary Jo Schmith of Front Avenue Pottery and Tile tonight for drinks! Thanks for following along with my NCECA notes. It's more fun with you along for the ride! Peltz: I didn't get that at all. We weren't supposed to do anything but artistic research. She found it freeing. Didn't have to worry about selling. Oestreich talking about wood firing. His fascination lasted 10 years, then it got exhausting, couldn't fire alone. Started altering, spending more time with each piece. in 1990, discovered oxidation soda at Alfred. "I'm beginning to miss some of that tradition," will be building a stoneware kiln. Aysha throwing an amazing bottle form, fluted with a trimming tool then puffed outward like a cushion. Jeff talking about feeling a new interest in curved shapes, not so much sharp angles, the romance of a wood kiln. Aysha now trimming heavily altered bowl from yesterday. Jeff: "I feel there are so many similarities between music and clay." Talks about his music teacher making him learn the foundation before making music. Each pot practice for the next one. Don't fall in love with your idea because it's going to change. 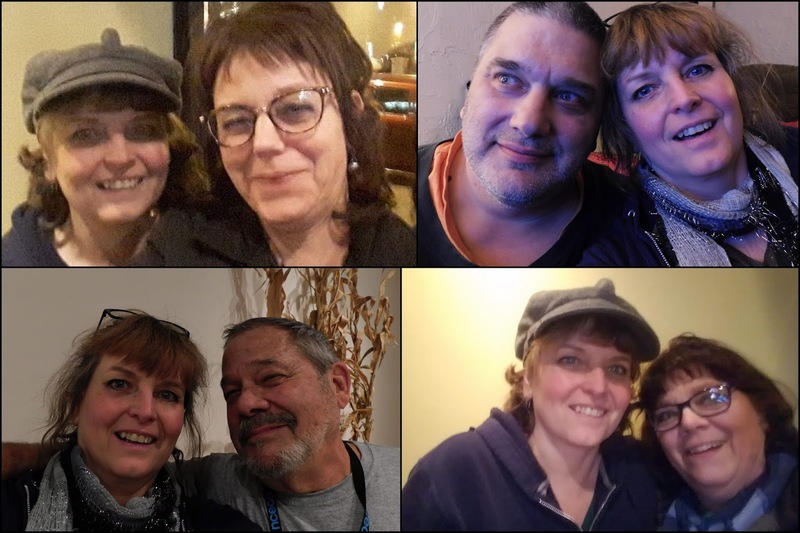 Telling a story about Warren: He wasn't searching for the perfect pot, he was on a different adventure. When you look at one of Warren's pots, you could get a sense of what he was passionate about. Often you look at a pot & it doesn't create its own backstory. Jeff: I know that with music I lose something if I am not able to play for a couple weeks. Clay is a different story, can pretty much just jump right back in even after months. Aysha: "I have a hard time warming up to it, awakening the body memory," when she has been away from it for some time. Has to go thru getting to know what my arms & body & fingers need to do. Question: It seems like each potter maybe especially young ones are under need to make pots that would not be confused with somebody else's pots. Questioner doesn't think that was true in 1970s. Jeff: More & more pressure as more & more people entering field, continuous pressure to be unique. Used to be a calming aesthetic that everyone was working towards, trying to retain a certain tradition. 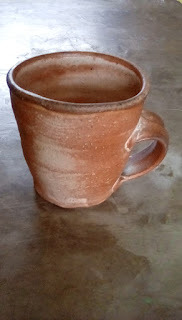 "The cup is the most difficult pot to personalize." Aysha trimming double ring, scooping out excess weight to prevent differences in thickness between wall & floor. Aysha: had to opportunity to watch Voulkos work, so much fun to watch. The way that he used clay & made marks & was so thoughtful in the decisions he was making was important to see. Everything was slow & contemplative. Questioner: Cheese cutter: take the original wire out, put a coiled wire in. Jeff: Used a stretched spring first. Used one from a cigarette lighter, then one from an old ball point pen. Hardware stores, kitchen supply stores. "Linda Christiansen just uses 5 tools. I have a thousand tools." Aysha: Also likes kitchen supply - can't find melon ballers or butter curlers anymore. Jeff: It took 30 years. Had been saturated in the leach tradition since undergrad. Wasn't until he started to teach himself - that opened him up to be able to receive other expressions & take in otehr things. "The work I do now is coming from design principles. I miss hte pots that come from the heart. " "Design principles are what's fueling me." ooo that plump bottle form Aysha threw is actually the lid of a jar! She's trimming it now. Jeff: social security takes some of the pressure off to make as many pots, allows him to spend more time with each pot. Question: what was your hand movement when making the stretched vase yesterday? Aysha: used sponge, makes sweeping motion. It;s body memory to know how to make the motion without hesitation. Jeff: what I am thinking about now is how this will pour. though it may end up being decorative it still has to function. Function is at the core. Pitchers don't come together until the spout; the spout makes it or breaks it. Aysha: Now making splash bowl. Demostrates new bat design from studioprobats.com. Ayash centers large balls of clay like I do, in two pieces. "You have to learn to make handles the Leach way" Pulled directly from the pot. Shapes fat coil roughly. Hugs Linda Arbucle. Aysha throws with two sponges! Aysha: This pot came out of making things the way I usually do, pushing mostly from the inside, so mcu evidence of building, was distracting. Labor & process were too evident. Started to think more about architecture. HOw could she try to introduce some of that into work. Jeff's handle is much wider than I wold have expected. Snips bottom with scissors! before attaching. Jeff says his handle is not long enough, is crap. I dunno, looks good to me. He doesn't press the handle against the body but gently pushes so the handle just kisses the pot. If I did that I'm pretty sure that handle would pop off. He's now pushing upward on the curve of the handle, saying the pot is perky so the handle needs to be perky. Aysha using butter curler to flute the interior of the bowl, to cause the glaze to pool & flow. Ooops it's 4 o'clock & they are done! What is the point of artists' statements? Be honest. Work doesn't have to provide the meaning of life to be valuable or interesting. If your work is about perfecting handles, say that. You don't have to reinvent the wheel. You can follow the structure of an artists' statement that you like. Use template? Why did I make this work? What response do I hope to invoke? What do people need to know to understand this work? Which aspects of my work are most important for people to take away? 2nd: Why do you make it? What inspires you? Why does you work matter today? How does it fit into the world? Went to three openings last night - the Northern Clay Center, the Vine Arts Center (which is, in fact, covered in vines!) 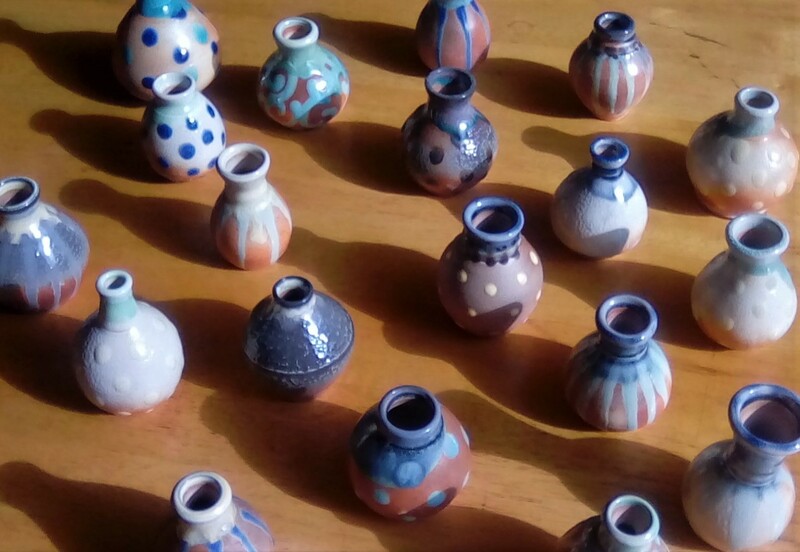 and the Potters of the St Croix Valley. I didn't take a lot of photos - there were too many people - but I took some. I should probably have carefully documented who each artist was, etc, but maybe this way is better - it gives a sense of the swirl of wonderful pots & potters all around, far too many to hold all the names in your head. "Using social media to funnel customers to the checkout"
In spite of my somewhat snarky commentary, I found this talk the most useful thing I attended at this conference so far! Instagram, how do you translate it into sales? New world? 30% of sm businesses still don't have a website, but practically all artists do. If you're selling, you are a business. People are on the web. 89% of Americans are online. Spend 24 hr a week online. Money Retail sales online in trillions "The spout where the money comes out"
Suggestion: engage jerks, turn relationship around. Doesn't always work. Or at least, you don't be a jerk, even if they are. Giveaways & contests - ask people to follow you to win. Convey & Convert is a lot of work, continue is easier. What are you specifically asking people to do? Your website is the hub. The goal of social media is to get them to your website. Get them onto our email list. Don't use Etsy! You are building Etsy's business, not yours. *Am I wrong or are these rules super obvious? "Oh, don't be boring, what a great idea, I never would have thought of that" "Don't be stupid? Damn it, I've been doing this all wrong."